We recommend that the students practice a minimum of three times a week, every second day for ten to twenty minutes. As for the practice content, we recommend that the student repeats everything they did in the lesson. Although this isn’t a lot of practice the most important thing is that it is regular practice. Setting the bar too high for the student can tend to backfire. Naturally students will tend to practice their instrument more in the opening weeks because of the novelty factor but that will very quickly taper off. Setting up the proper environment for the student to learn at home is very important. A good practice environment should be free from distractions. Pick a location that is tidy and quiet to help the student to concentrate. The student’s tools need to be easy to access, we recommend that the student buys a guitar stand so they can set up their guitar somewhere accessible to encourage them to pick it up and play it whenever their mood takes them. To practice effectively a student needs a proper music stand that can be set up in their designated practice area. Eventually the student will need some sort of CD or media player so that they can play along with pre-recorded music. All of these items need to be set up strategically so that the student can sit in their practice area and quickly reach their instrument, their music and their media player without excessive effort. Unfortunately practice carries the stigma of being boring or a hassle, but you can take some steps to help rectify this. Encourage the student to get in the habit of taking their guitar out of its case when they arrive home after lessons and set it up on the guitar stand, take out their book and leave it open on the music stand to help make practice as easy and accessible as possible. 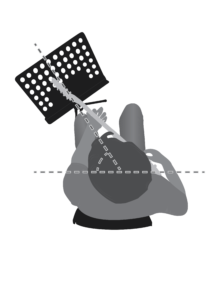 The student’s music stand should be placed slightly to the side of the student’s sitting position so that the student’s line of sight draws a straight line from their eye, through their fret hand to the music stand. Most students will be tempted to place the music stand directly in front of them in the same way that they use a notebook or a computer, but this isn’t ideal for learning the guitar. With the music stand placed to one side the student will be able to see the music stand and their fret hand with only minimal movement of their head, decreasing the strain on their body and simplifying the process of comparing what’s written on a handout to what they are doing on the fret board. In time the student will be able to simply watch the music on their stand and be able to follow the movements of the fret hand in their peripheral vision. Teaching a student how to practice! It might seem like an unusual statement but in truth it’s something that we take for granted. We ask students about their practice time so often, but does the student really understand what practice is, and how best to do it? Don’t think the student will ask you what practice is if they are confused about it, most people either assume they know how to practice, don’t ask about it because they are embarrassed that they are unsure or simply won’t do it correctly! Most students will have some sort of work book, or page holder/marker in their work book to indicate which exercises and pages need to be practiced at home. In most cases a teacher’s first priority is to maintain the student’s interest and enthusiasm in the lesson, with that under control a teacher can achieve anything, it’s simply a matter of time. One of the most common complaints teachers hear about their students is that parents feel that although the student is enjoying coming to lessons they don’t seem to want to practice at home. Particularly in the case of young students, lessons are so enjoyable because the student is the centre of the teacher’s attention. In most cases the opening stages of learning an instrument aren’t sufficiently exciting enough to hold the student’s attention, in fact without the teacher present to keep the lesson entertaining the lure of the musical instrument and the experience it provides becomes significantly less enticing. Once the student is back home they often find practice to be too boring without the teacher there to keep things entertaining, which results in the student becoming disinterested in the practice session at home and avoiding practice entirely. In the short term, parents play an important role in the practice sessions at home as well. Having the parent sit in on the practice session at home will help to recreate the learning environment provided by the teacher. The parent need not understand how to teach the instrument or understand everything that’s in the students work book, but merely make themselves a part of the practice session. Parents can make themselves a part of the student’s practice session by encouraging the student to play the exercises appointed by the teacher, being encouraging and making comments at the end of each exercise. Generally parents will be able to see the benefits of this technique but be limited by their family and work commitments. Once the student is able to play songs along with a recording, parents will likely find that the student will acquire their own genuine interest in the learning process and be more self motivated. Being able to play along to recordings creates a whole other avenue for generating enthusiasm; try encouraging the student to put on a miniature concert for family and friends at home. It needn’t be a concert of epic proportions merely an opportunity for the student to play in front of people they are comfortable with. Provided the student receives positive recognition at the end of their performance the student will look forward to their next opportunity to impress their audience. 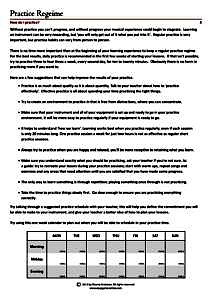 For more information on practice, check out the handout below.